So often, when people tell stories of the desert, they are stories of adventure, stories about an important quest. As a child of a desert, I did not question my surroundings, nor did I find any extraordinary meaning in them. When my brother and I wanted adventure, we would take to the desert behind the house, build forts under the shade of a mesquite tree, hang trinkets from the palo verde tree, dig trenches to hide our buried treasures under a thicket of prickly pear cactus. These secret childhood places branched off the arroyo running through the backyard; it was our personal highway we shared with the javelina, bobcats, rattlesnakes, mule deer, all getting where we had to go. Harris hawks and turkey vultures watched from above, cast their shadows on our playground. The sun was warm on my head and my back. Often, my brother and I returned home with sand in our shoes, mica flecks under our fingernails, leaves of creosote bush stuck in our curls. I wouldn’t say we were wiser, but we learned to hold the secret wonders of our play. The desert was ours, and this was a gift. As a child of the desert who now finds herself as an adult here too, I find the desert-as-quest stories just as embodied in the spirit of children’s play as in the adult’s search. Reading L.I. 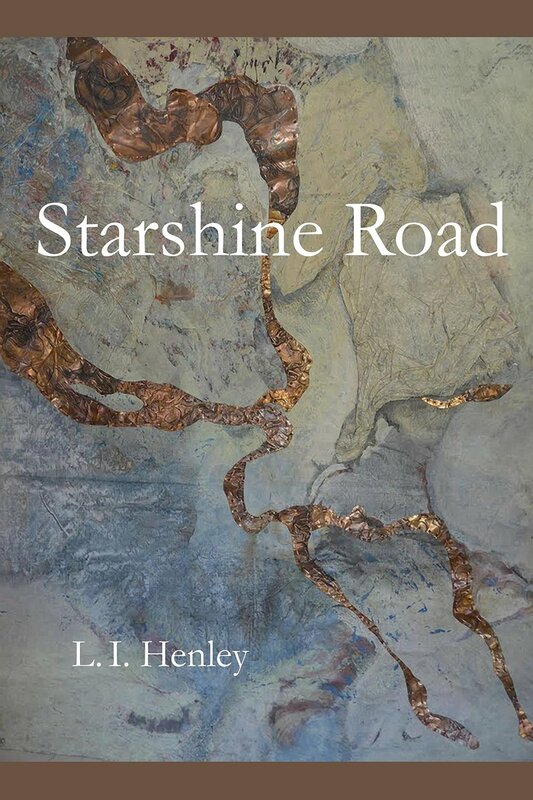 Henley’s Starshine Road is like the experience of walking the arroyo to my childhood home. I am using memory as well as instinct to traverse its pages. The trail is familiar and disorienting. These are poems deeply situated in a specific place and time, and yet Henley allows enough space for readers to see with our own eyes. We get to do the seeing beside the poet, as if traveling on the same trail. This might be the very nature of the desert-as-quest story: we have to set out to see things differently. Henley plays with readers’ sense of discovery, returning to the place, the people, and the objects we know, casting them all in new light or with new details. Perspective is called a problem, yet I read it is the central resonance of the book. Henley asks readers to look and reimagine it all. The images of her desert are fractured and collaged. Another thing about these desert-quests: you can set out to see things differently, but sometimes it is more important to see the same old things in a different light. the coffee can becomes / a man with many faces. Though these objects are identified, they behave as embodied characters. whoever lived here ten years ago. In the desert-quest, you meet strangers who are friends and friends who are strangers. water like thick honey from the comb. These are poems of loss, of desire, unambiguous and large, poems about memory and fortitude. These are poems to take with you when walking. These are poems to read under starlight. If I had found this book when I was a child, I wouldn’t have known what to make of its pages, of its intensely described, haunting world. I wouldn’t have known what to make of the emotional texture of the place, or the idea that memories can be re-examined and altered with time. But somehow, this book still feels like one that could have protected me, a book that the playful child grown into the adult seeker finds like a fragmented map. That is to say: I feel emboldened having read it. I feel like I’ve accomplished a quest.